I originally did the painting for a local art exhibition. The image embodies what I most like about painting classic cars, capturing the sunlight catching the sleek curved lines and chrome. Its use by Atlas makes it one of my most successful paintings so far. I still have the original painting hanging in my study / studio as inspiration for future paintings. If I had the choice of any classic car, a Jaguar Mk2 would be very high on my list, ideally with spoked wheels and the open rear wheel arches this one has, plus maybe whitewall tyres for good measure! The Jaguar XK120 was introduced in 1948, so named because of its ability to reach 120 mph. It was only envisaged that a relatively small number would be built to showcase the new Jaguar XK engine, hence the earliest ones had hand-built aluminium bodies. Demand for the XK120 exceeded all expectations and it became a great success. As a result, from 1950, pressed steel was used to cope with the demand. The XK120 was initially introduced as a roadster, followed by a fixed head coupe in 1951 and a drophead coupe in 1953. This fine example is a drophead coupe dating from 1954. 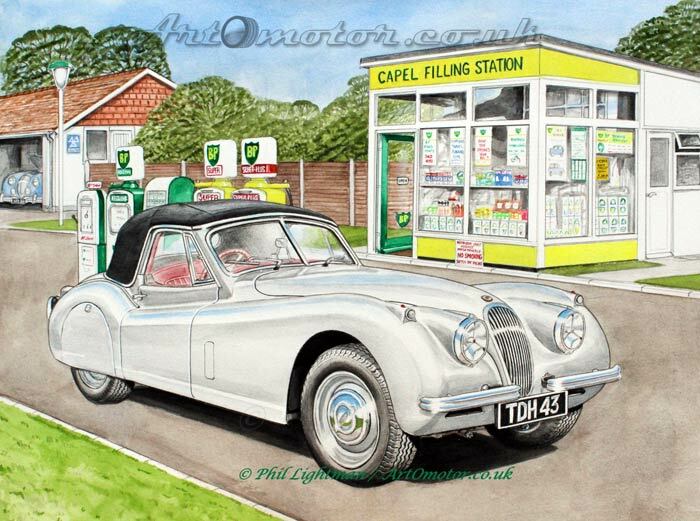 The owner asked me to portray the car against a backdrop of my late parents' petrol station, similar to an earlier painting I did of a Jaguar Mk 2 elsewhere in the gallery. The background took much longer to paint than the car! The final incarnation of the E-Type was the Series III from 1971 to 1974, which introduced the V12 engine. Changes to E-Types over the years had been influenced by the American market and the Series III became much more of a grand-tourer than it had previously been. Whilst there are those who say that the later E-Types lost the purity of line of the originals, to me, all E-Types are special. The flared wheelarches accommodating wider wheels and tyres give Series IIIs a lot of street presence. 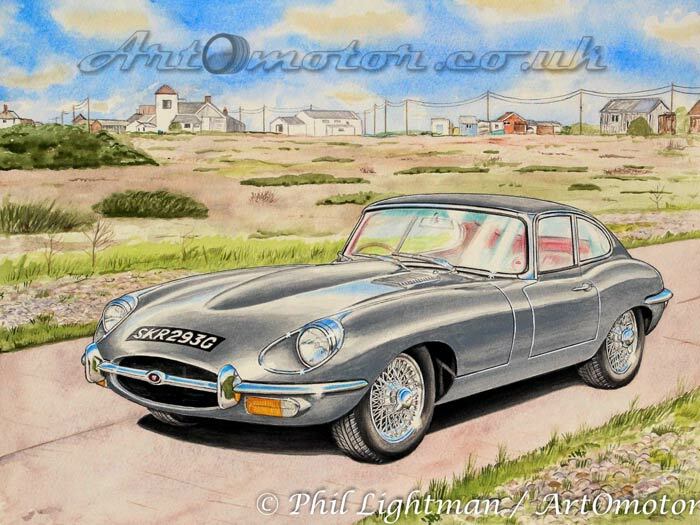 This painting was requested as a surprise Christmas present for a member of the Jaguar Enthusiasts Club South Kent Region, and I think it's one of my best to date. The Jaguar E-Type is a design icon which took the world by storm when introduced in 1961. The Series 2 was introduced in 1968, and like the interim 'Series 1½' introduced the previous year, had headlamps, which lacked the earlier faired-in covers, but were more effective. Series IIs are distinguished by a larger front aperture with a more substantial chrome bar across it, larger indicator / sidelight units re-positioned below the bumpers. I originally photographed this car at Dungeness on the Blackpalfrey Tour of Kent 2013, and the owner wanted this background as a reminder of days spent fishing there. At the time, the car was primrose yellow but a subsequent full renovation revealed the need for more extensive work that led to a full respray in opalescent grey. The final incarnation of the E-Type was the Series III from 1971 to 1973 which introduced the V12 engine. This one is a roadster. I have admired this car for some time, and I particularly like the chrome spoked wheels and whitewall tyres. I first asked the owners if they wanted a painting of it several years ago, but it was only recently they asked me to create one for an anniversary present. They asked me to portray it with the pretty village of Loose (near Maidstone) in the background, as it had special significance. I visited the location to get some reference photos, and this is the result. There is a cameo role for a green Mini in the background, which is a car they had previously owned. 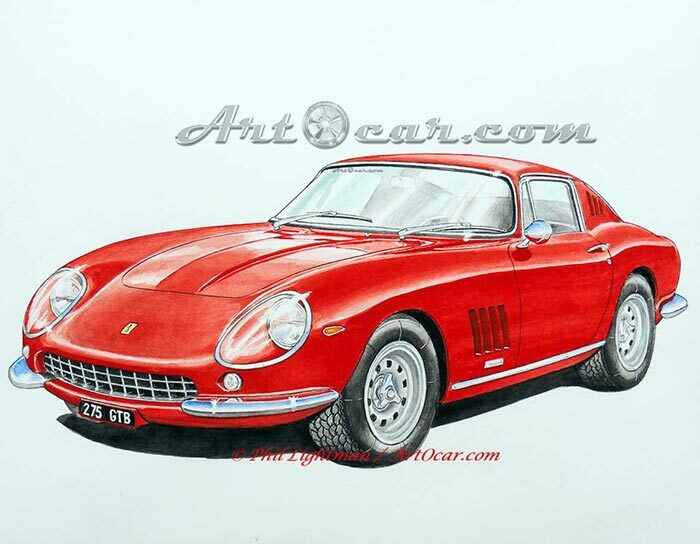 The Ferrari 275 GTB came out in 1964, designed by Pininfarina and built by Scaglietti. It featured all independent suspension and disc brakes all round. A Series Two version with a longer nose came out the following year. The 275 GTB/4 was introduced in 1966, with a four-cam engine with six carburettors, visually distinguished by the slight bulge on the bonnet. I got the inspiration to paint a Ferrari whilst at Goodwood Revival this year, taking many photos, and when I saw this, it seemed an ideal subject. The bonnet bulge confirms it as being a 275 GTB/4 in classic red with the Campagnolo 10-slot alloy wheels and Michelin tyres that were the standard fitment at the time. The 275 GTB is one of the best looking and most desirable Ferraris of all time. Today's values are in excess of £1 million, with GTB/4s achieving double! The painting was done to be exhibited at a recent local art exhibition, and is now available for sale. It also adds some glamour to my website gallery! The Lotus-Cortina spearheaded Ford's involvement in motorsport, which did much to improve Ford’s image and desirability. 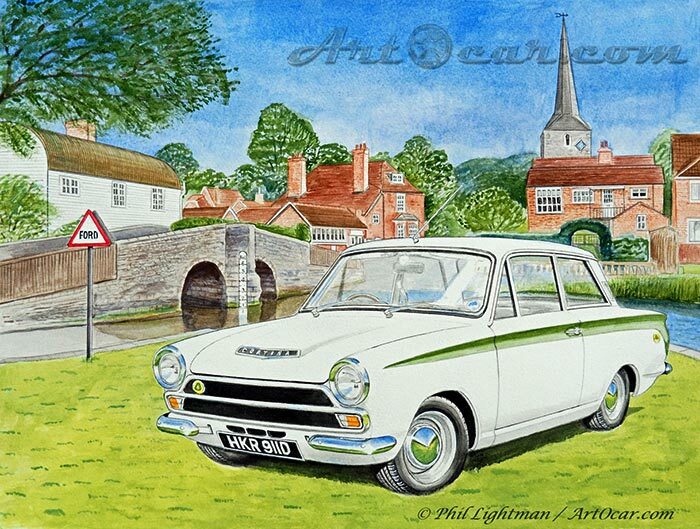 Commissioned as a surprise birthday present for the owner following a conversation at a classic car show, I was asked to portray the car against a backdrop of the picturesque Kent village of Eynsford, incorporating the Ford sign. After assembling photos of the location from the net, I visited the village for additional reference. It is not actually possible to park where the car is portrayed, but never let the truth get in the way of a good picture! The MGA was launched in 1955 and marked a radical departure from the T-Series MGs that preceded it, with a fully enclosed body rather than the exposed mudguards of earlier cars. MGAs remained in production for some 7 years, until replaced by the enduring MGB in 1962. This car dates from 1956 and so is one of the earliest. It has the original style steel spoke wheels. The current owner acquired it back in 1984, and it was fully restored and back on the road by 1988. I have admired MGAs for some time, so was pleased to get the opportunity to paint this one, which followed a conversation with the owners the previous rally season. As usual, I have incorporated the badges that make the car individual. MGAs are widely regarded as one of the finest British sports cars and are much sought-after nowadays. This car is a Riley RMB dating from 1950, its 100 bhp engine making it capable of over 100 mph when new. The car started life as a standard 4-door saloon, but was converted to a 2-door convertible in the 1970s. It was extensively re-built by specialists in the 1990s to concourse standards with no expense spared, works including a new ash frame, bespoke body with complete rebuild including chassis, all running gear, uprated engine, instrumentation and interior. It became a drophead coupe, unique in having the hood hidden under a metal cover when open. In the mid-1950s a group of 6 students from Oxford and Cambridge Universities undertook on an overland expedition from London to Singapore. They took 2 Land Rover 86' Station Wagons which were supplied by Land Rover. They obtained sponsorship from a number of sources, including the BBC, thanks to a very young David Attenborough. Their film of the journey was featured at the time on a BBC nature series, and was released on DVD in 2008. Their exploits were also captured in a book 'First Overland' written by Tim Slessor, one of the students. A group of Land Rover enthusiasts aimed to repeat the journey in 2010 and prepared 2 vehicles – this one in Oxford blue, plus another in Cambridge blue. They were fitted out exactly the same as the originals, including the sign writing. 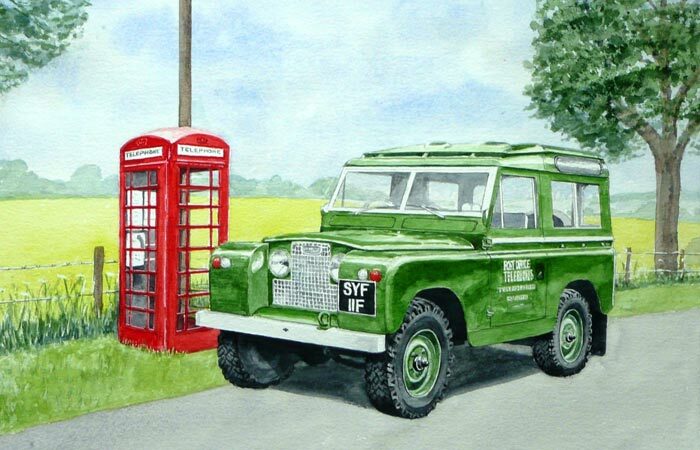 Due to political uncertainties in Burma, the 2010 expedition never went ahead and the vehicle was acquired by a Land Rover Series I collector who commissioned this painting as the 2015 Charity Land Rover Auction image. The vehicle is a Land Rover Series I 86” dating from 1954, and has the original 2000cc engine and running gear. 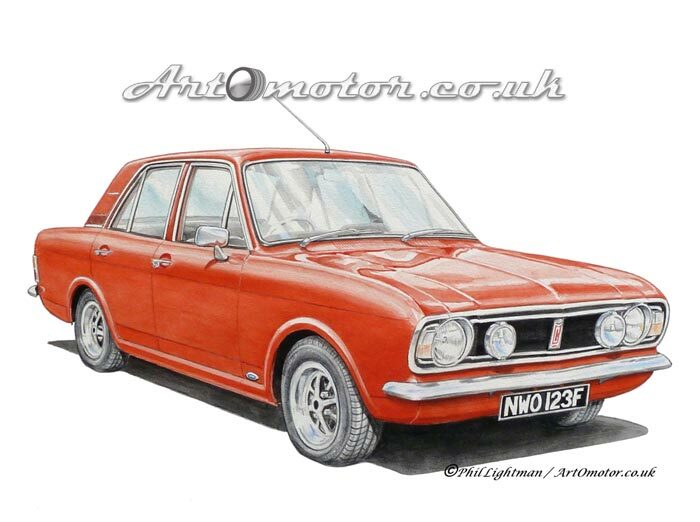 245 RRT is a well-known Ford Cortina MK I featuring in books, magazines and on TV. It dates from May 1963, originating in Lowestoft. By the 1970s, the car had covered just 6000 miles with its original owner, and was put into dry storage. From 1982 onwards, it was used by a Norwich Ford Dealer as a centre-piece of a showroom display, continuing through until the 1990s. It was then sold to an owner in Nottingham who covered just 2900 miles in his 22 years of ownership. The car featured on Top Gear back in 1993 with Michelle Newman and Jeremy Clarkson when the Mondeo was launched (still available on You Tube), and has also appeared in a number of magazines. The car is on the front cover of the book Ford Cortina – The Complete History by Russell Hayes, published by Haynes. The current owner acquired it in 2012. It still had the original cross-ply tyres, now removed for safety reasons but kept safely in storage. The car has a lot of original documentation, including the original logbook signed by Sir Terence Beckett, Ford UK’s Managing Director during some of the Cortina years. The car is a regular attendee at rallies in Kent. It is portrayed in front of a Cotswold style dry stone wall, at the owner’s request. 'Poppy' is a Land Rover Series I 80', one of a batch of four red 'Fire Trucks' delivered to Derbyshire Fire Service at the beginning of 1949 based at Bakewell. This batch were the first red fire service vehicles produced by Land Rover. The vehicle is one of a pair now in the same ownership, and was the subject of a full nut and bolt restoration in 2012, the owner using knowledge and skills he gained by whilst helping his late father restore his Spitfire at their family business in Goudhurst during the late 80s and early 90s. The composition was something of a compromise to incorporate the Spitfire and the Garage as well as the vehicle itself. The painting was done as a surprise birthday present for the owner, who was very pleased with it. The PA Cresta and Velox were introduced in 1957, a design echoing American styling of the time with wrap round windscreens, rear fins, and much chrome. The Cresta was the slightly more luxurious of the two. Many had optional two-time paint and whitewall tyres. The car shown car dates from 1961, originating in Wiltshire. The current owner bought it as a reminder of one he previously owned in his younger days. It had only 3 previous owners in its long life. It has the optional whitewall tyres that were popular when new, which I think greatly enhance it, and was recently fitted with a sunvisor. 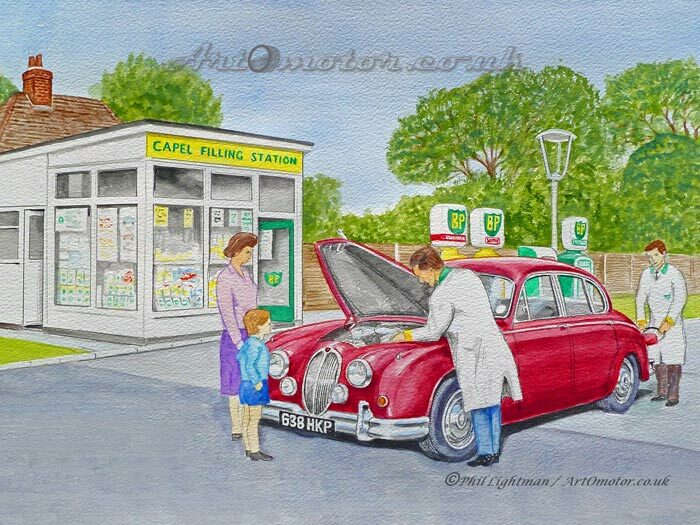 I was especially pleased to gain this commission as I can remember drawing one in a petrol station scene early in my childhood. The picture survives to this day, also including a Ford Anglia, and is on my Facebook site. The Triumph Stag was introduced in 1970; a handsome roadster with detachable hard top. Sadly, it gained a reputation for unreliability, especially overheating, which at the time blighted its standing. Nowadays, a greater understanding of the various issues means Stags are a reliable ownership proposition, provided they are properly maintained. Nearly 26,000 were built, and it is believed that some 9,000 still remain, with one of the largest single-model owners' clubs in Britain. This example is in Mimosa yellow, enhanced (in my opinion anyway!) by chrome wire wheels and whitewall tyres. The badges have been faithfully reproduced in the painting. The Rover P4 originally dates back to 1949, and was gradually developed and enhanced during its long life, lasting until 1964, overlapping the P5 for its last 6 years. Quite a few of them were two-tone like this one, which was new in 1960. The car shown car spent most of its early life in Wales, until being bought by an enthusiast in 1984. The current owner bought it on seeing it at the NEC Classic car Show in 1991. It has many original features and documentation, including all MOTs and most tax discs. It is well looked after and regularly rallied. At the owners' request, I have portrayed it against a backdrop of Dover Castle. The Micholotti-styled Triumph TR4 made its appearance in 1961, marking quite a radical re-design from the TR3 that preceded it. The TR4A came out in 1964 with independent rear suspension, and the TR5 offering a 6-cylinder 2.5 engine in 1967. Both were outwardly similar to the TR4, but the front and rear were re-shaped in 1968 to become the Triumph TR6. 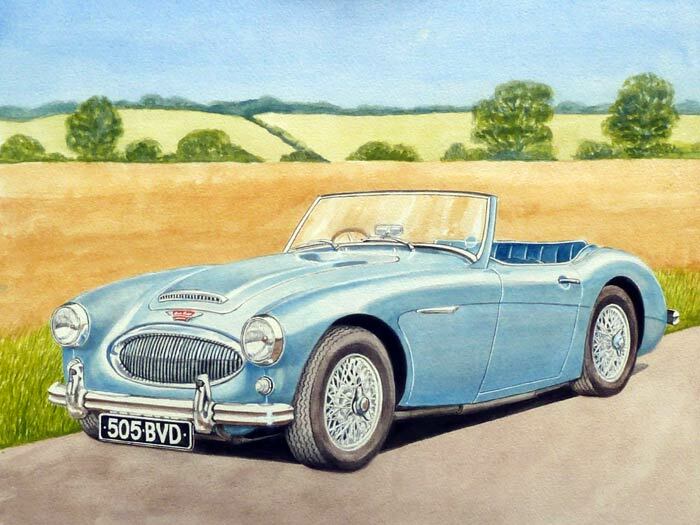 The painting depicts an immaculate TR4A that regularly attends rallies in the south east. 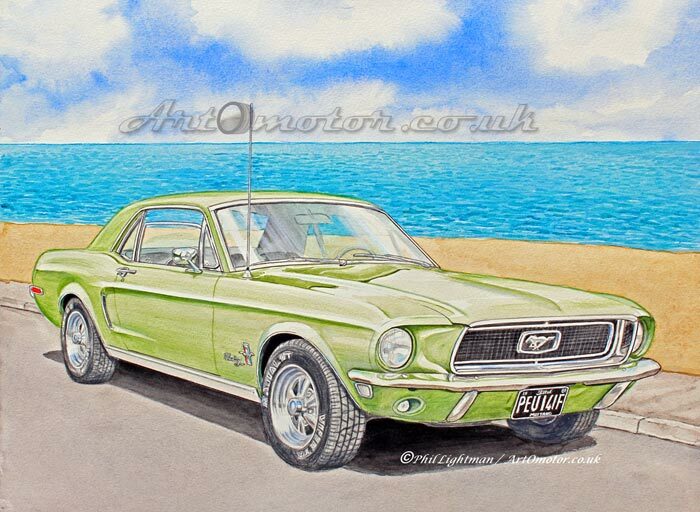 This is one of my favourite paintings so far, with the sunlight catching the paintwork and chrome. The Triumph TR2 came out in 1953, essentially creating the new genre of British sports cars which also lead to the MGA and Austin-Healey. The car portrayed dates from 1955 by which time shorter doors had been introduced to make made them easier to open at the kerb. 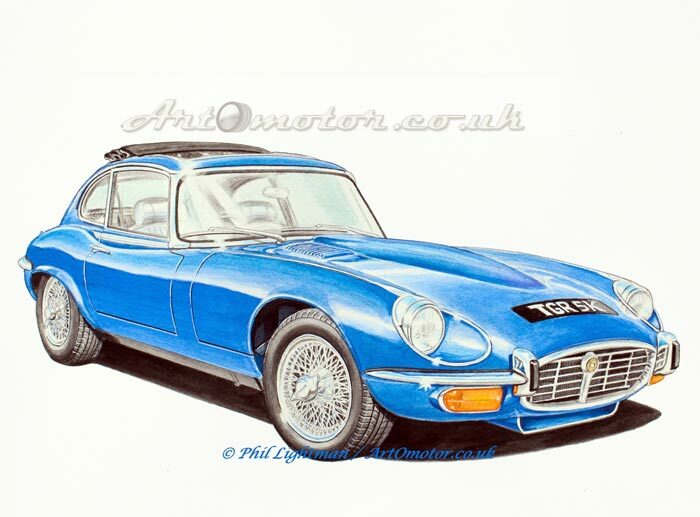 The painting was commissioned as a surprise Christmas present for the owner, based on a few photos, none of which showed the car at the correct angle. The request was for it to be portrayed against the backdrop of the St Gotthard Pass in Switzerland, based on a supplied head-on photo of the car. I looked to the internet for additional reference material for the location, noting the consistent damage to the St Gotthard sign which I have captured. I was very pleased to subsequently see the car at a classic car show and meet the owner, who is pleased with my attention to detail. The W113 SL was introduced in 1963. It was the styling of the optional hardtop shown here that lead to the enduring nickname 'Pagoda' by which these cars have been known, virtually from the outset. There were 3 engine options during the model's life, but only one at any one time. Initially introduced as 230SL, replaced by the 250SL in 1967, and succeeded by the 280SL the next year, lasting until production ceased in 1971. Pagodas have a substantial following nowadays, which has seen a significant increase in their prices. I have chosen to portray one of the earlier ones with the separate centre hub caps and rim embellishers, which I think look better than the later full wheelcovers. This was one of several images painted for display at special events at my local Mercedes-Benz dealership. The Land Rover initially resulted from Rover's Chief Engineer deciding to build his own version of the wartime Jeep for use on his farm. The Land Rover was introduced in 1948, and immediately became popular for use by farmers and others needing to go off-road. Its off-road abilities were and remain unrivalled. This vehicle is the 11th one ever built, before full production started. The vehicle has been restored to original condition and has travelled widely, including a trip to Russia. The painting was commissioned as a surprise anniversary present for the owner, who is involved with the Kent Branch of the Series I Club. The image was also used to create an Anniversary card signed by all the members. I think this is one of my better paintings, and the image is available as a greetings card. 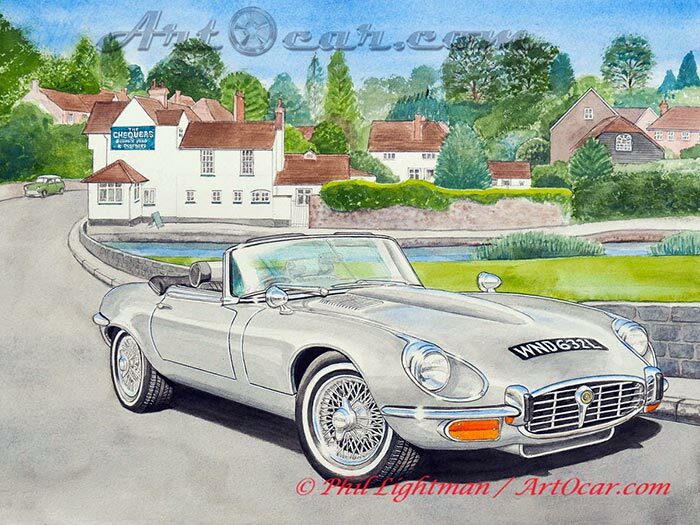 This painting shows the roadster version of the E-Type, now said to be the most sought after. This is the Series I version with the cowled headlamps. All is not quite as it seems. The car depicted, although visually identical to an E-Type, is actually a Challenger historic replica. The bodyshell is moulded, based on a 1961 Series I. Some 250 Challengers were built, the last in the early 1990s. SYF 274 is a 107" long wheelbase Station Wagon first registered in 1956. It started life with the Ministry of Transport and Civil Aviation. Its duties included being used as a snow blower for airfield clearance in days when snow was more commonplace than it is now. The painting was done as a present for the owners, in recognition of their organisation of a historic Land Rover event. The vehicle was fully restored at Dunsfold in 2009. The Dunsfold Collection of Land Rovers has now been given charitable status. The legendary and iconic 300SL has always been known by the name 'Gullwing' due to the way the doors are hinged from the centre of the roofline. This arrangement was necessitated by the high tubular spaceframe chassis introduced to reduce weight. It was racing success in 1952 that led to a request from a US car importer for a road-going version. Some 1400 were built, over 80% of which went to the US. It was a great success, enhancing the company's reputation there. The Coupe version seen here was introduced in 1954, and was succeeded by the roadster version in 1957 SL stands for 'Sport Leicht (Sport Light), with 300 referring to the 3.0 litre engine. 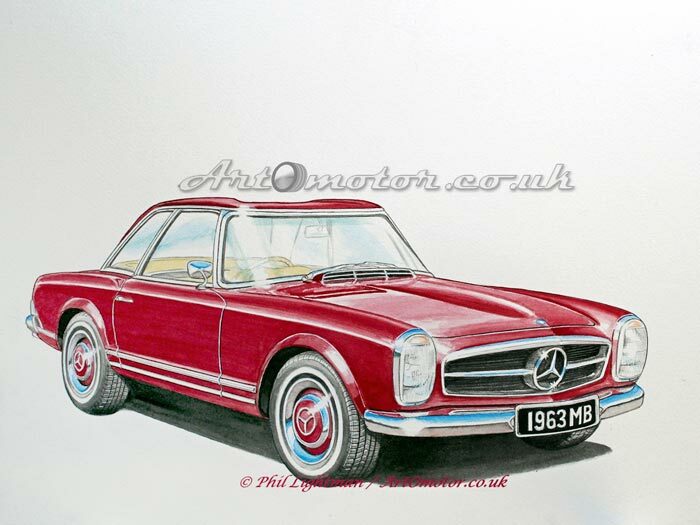 This painting was based on the one on show at Mercedes-Benz World, and was featured on Channel 5's excellent The Classic Car Show programme. The 'S' on the grille marks this car out as a Cortina Savage, the only external evidence of the Zodiac 3-litre engine within. The Cortina Savage was conceived by Jeff Uren, a former Ford works driver who converted Mk II Cortinas by fitting a tuned version of the then new Essex 3.0 litre V6 engine, as well as other upgrades to handle the increased power. The majority of Mk2 Cortinas converted were 1600Es, but there were also Lotus and GT-based versions (including estates). A total of about 1100 Savage-branded Cortina conversions were sold The car above has Dunlop 8-spoke rims which were popular option on many Savages. The Jaguar Mk 2 proved a great success for Jaguar, the basic shape being available for some 10 years, also spawning the S-Type and 420, as well as the Daimler V8. Popular in its day with both 'cops and robbers', those that have survived and escaped banger racing are much sought-after, with values increasing. Revisions were made in 1967, when Mk 2s were renamed as 240 and 340. The most notable visual differences were slimmer bumpers. The car dates from 1967, and was one of the last to have the thicker bumpers. The current owner bought it from a fellow enthusiast, with only 3 former owners and 48,000 miles. It has undergone recent body, engine and woodwork restoration. The AEC Regent was East Kent's standard double deck choice from 1959 to 1967, with some 161 in all. The first 40 arrived in 1959 to a full-fronted style, but all subsequent Regents were to this half cab design first introduced in 1961. Batches were received in all but one of the years until 1967, each batch having minor detail differences. WFN 842 was one of the initial batch of half-cab Regents. I chose to portray one from this batch because it has the illuminated advert panel between decks. I have shown it passing through Farthingloe en route from Dover to Capel and Folkestone on the 90, my route! There was an 18 month gap between starting and completing this image. The finished painting is 20" x 16" including cream mount and is currently available for sale and also included in my range of A5 greetings cards. I have done several other paintings of East Kent Regents. The Mustang celebrates its fiftieth anniversary this year, being officially introduced in April 1964. The Ford Mustang was a great success form the word go, with over 1 million sold within the first 2 years. Detail changes were made each year; my own personal favourites were in the years 1967-1969. This car originated in Florida and has been restored at great expense. It has an extensive history which includes the original handbook and bills and receipts from when it was in Florida. The wheels are Cragar 14-inch chrome. The original push button radio remains in the dash, with a concealed CD/radio in the glovebox. Like many of my paintings, this was done as a surprise birthday present for the owner. The Land Rover came out in 1948, inspired by the American Jeep. From the outset, it exceeded all sales expectations. As well as the target use for farmers, Land Rovers have been used extensively by the military, and for recreational off road use. Old Land Rovers now have an extensive and dedicated following. One of the items in the auction during each Charity Land Rover Run is a Commission for one of my paintings. 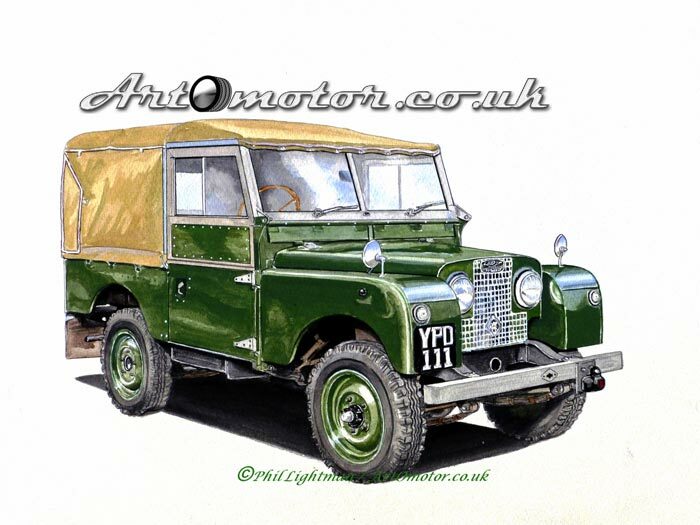 The 2013 winning bid was for me to create a painting of this Series I Land Rover dating from 1955. (The 2012 winning bid is a purple Series II Land Rover elsewhere on this site). 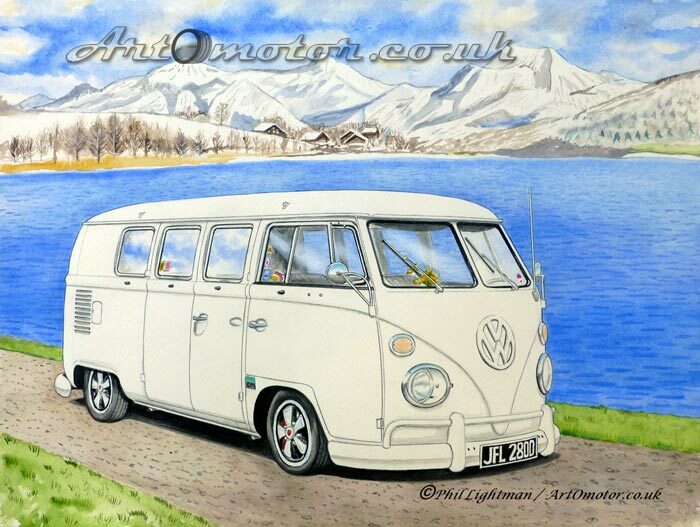 I was asked by a work colleague to portray this white Camper in an alpine setting as a birthday present. The vehicle is nick-named Flo. So that the vehicle stood out from the snow, the picture needed some contrast. Knowing Fussen in Germany was to be a future holiday destination for Flo, I sourced this lake scene from the internet. The image was made into a Greetings Card which was opened prior to the painting being revealed, and both were very well received. 2015’s annual Charity Land Rover Run was a weekend trip to Brugges to raise funds for the Battle of Britain Memorial Trust, marking the 75th anniversary of the Battle of Britain. Event organiser Peter Wales, who works tirelessly to ensure each event is a success, says a big thank you to all concerned. 2016's chosen charity is the Dunsfold Collection which preserves Land Rovers of all ages, and is now a registered charity. 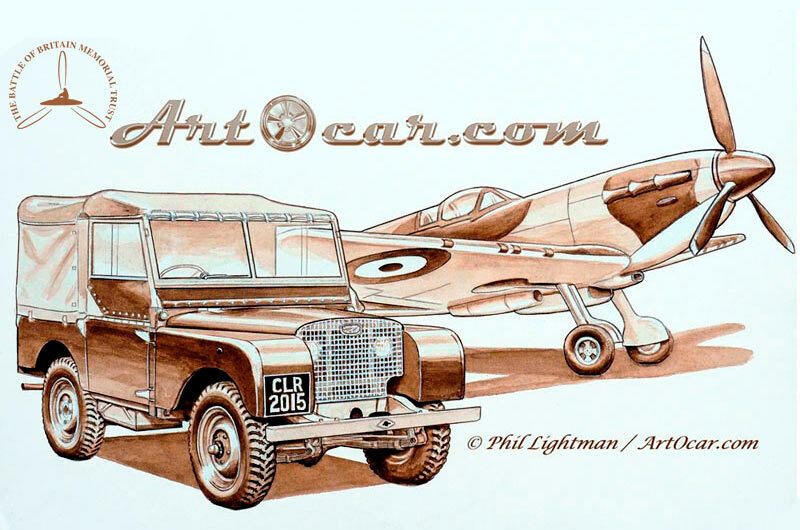 My annual involvement is designing the logo / T-Shirt emblem which this year is a sepia painting of a Land Rover with a Spitfire, as seen on my gallery. The Auction also includes the opportunity to bid for a commission of a painting of the choice of the person with the winning bid. Extensive work has been done on this car, including replacement of most of the body panels, re-upholstered interior and fully overhauled engine. 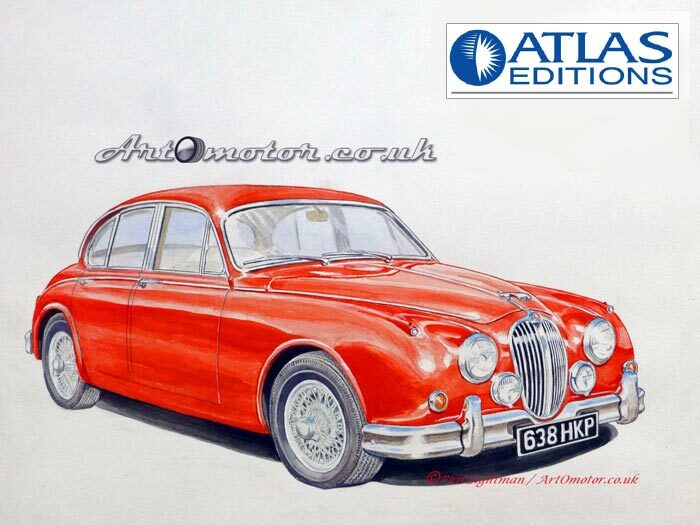 I had to complete the commission fairly quickly to enable the image to be used in information posters on the car at a Cortina 50th Anniversary Event. A further Pagoda SL, enhanced by the whitewall tyres fitted to many Pagodas. Again, I've chosen the earlier version with the separate hubcaps and wheel trim rings. This painting was an earlier version of the silver one above, which I initially abandoned as I'd drawn it too small and too low on the page. After starting afresh with what became the silver one, I realised this was salvageable, and chose to portray it in metallic burgundy as a complete contrast. Like the other SL portraits, this image is for sale. East Kent's first rear-engined double deckers were a batch of 20 Daimler Fleetlines received in 1969. 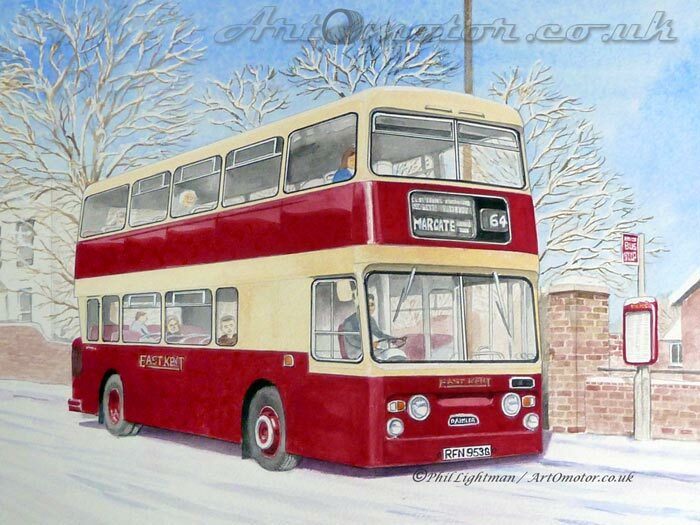 They were the last double-deckers to be delivered in East Kent's traditional cherry red and cream livery. Although some were initially based at Canterbury and Folkestone, all were at Thanet within a fairly short time, where most of them spent the majority of their lives. The Park Royal bodywork marked a radical advance from what had gone before, and caused quite a stir when the vehicles were first delivered. The style became commonplace for much of the next decade, with similar looking vehicles in service in most English cities. My favourite double deck design, with East Kent's being the best examples. RFN 953G is numerically the first of the batch, and is now preserved in its original condition. It is a regular attendee at rallies in East Kent. It is portrayed at Newington Road, Ramsgate, specifically painted as a snow scene for use as a Christmas Card, but likely to modified into a summer scene. 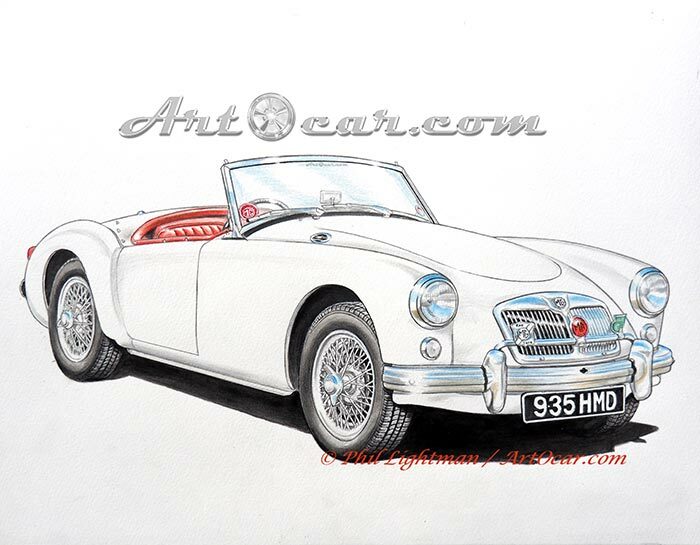 The Austin-Healey marque dates from 1952 when Austin, looking for a new sports car to replace the unsuccessful Atlantic, agreed to build the Healey. The same basic shape gradually evolved over the years, with the last ones being produced in 1968. 6-cylinder engines were introduced in 1956, and the use of a 3-litre engine in 1959 lead to the designation 3000. Nowadays, Big Healeys are much sought after as classic cars. This car is dates from the early 1960s. The painting was commissioned as a surprise birthday present for the owner. The image is available as an A5-sized greetings card. Homage to my late parents, who always encouraged my interest in drawing and painting. It was my Dad who first taught me perspective, and he was a great car fan. Our garage was on the main road to Dover at a time when the self service – now taken for granted - was unheard of. The cars, buses and lorries that drove past, and sometimes called in, undoubtedly lead to my lifelong interest in motoring. This painting was based on a promotional photo when my parents had won a competition for oil sales. This Jaguar was the first car I can remember my Dad owning, succeeded by a British Racing Green one that he later swapped for a Rover P5. I changed the colour from white to maroon to make a better image, and I have recently enhanced the painting to give more definition. JG 652 and FN 9094 were both Leyland Tiger TS1s, dating from 1930 and 1928 respectively, that started life with open-top bodies. 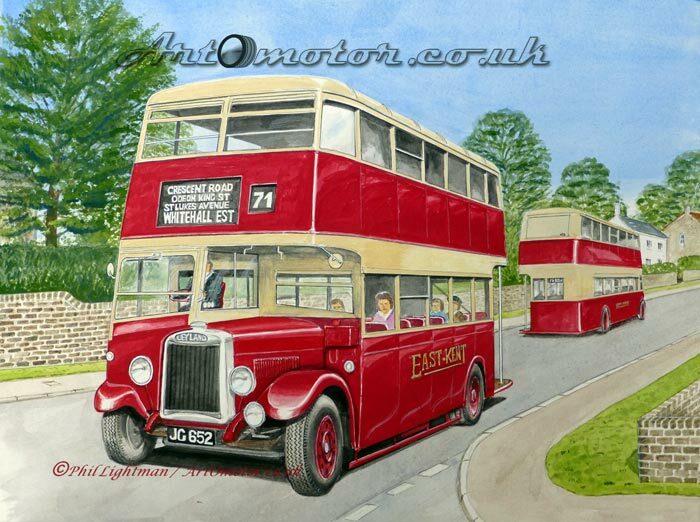 Following war damage, both were both re-bodied in 1942 with Park Royal double-deck bodywork to a utility style. They were the only lowbridge utility bodies ever built by Park Royal, and were thus unique. I was asked to portray the pair of them passing each other. This proved somewhat challenging since very few photos of either vehicle exist. 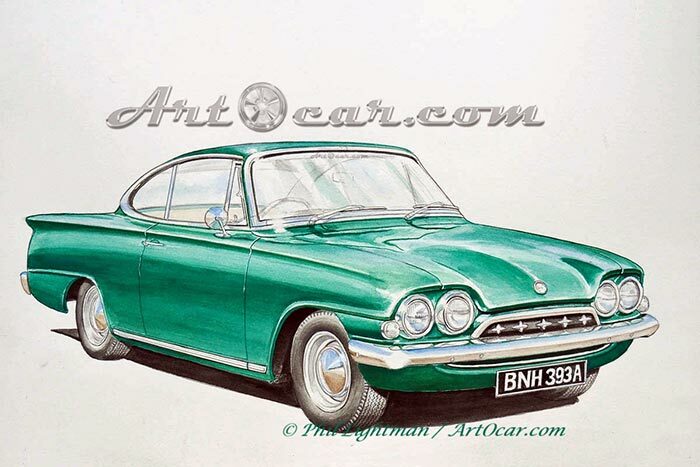 The original Capri was a 2-door coupe version of the Ford Consul Classic, initially only destined for export but available in the UK from January 1962. Much more handsome than the Classic that sired it, Consul Capris are now sought-after as classic cars. Early ones were underpowered, but a larger engine was introduced in 1963. The car overlapped the early Cortina Mk Is for most of its production life. Disappointing sales meant it was discontinued in July 1964, making it one of the rarest cars from Ford of Great Britain. The Capri name made a comeback in 1969, as the "Car you always promised yourself". This image is available for sale, and the registration number can potentially be modified. This painting depicts Todmorden No. 2, a Leyland Titan PD2/1 with low-bridge Leyland bodywork dating from 1948. The vehicle has been restored by its owner David Powell, and is now kept in Kent, although sometimes returning to its native Yorkshire. 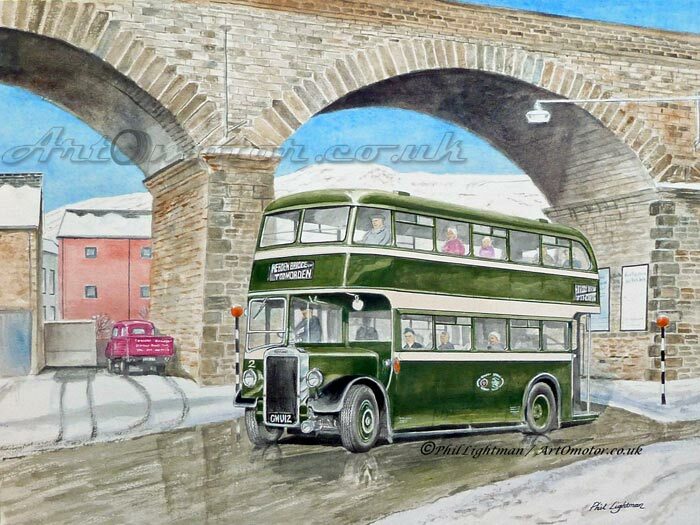 It is shown against a backdrop of the viaduct in Todmorden, based on a photograph of the vehicle whilst in service, taken by the owner. I first saw the vehicle in Maidstone, and a discussion with David subsequently led to commissions for use as Christmas Cards. This image is available as a greetings card, as well as another view of the same vehicle approaching the bridge at Cliviger, against a backdrop of Thieveley Pike. Both are snow scenes making ideal Christmas cards. One of the more modern cars I've done! This painting was done for an existing client. 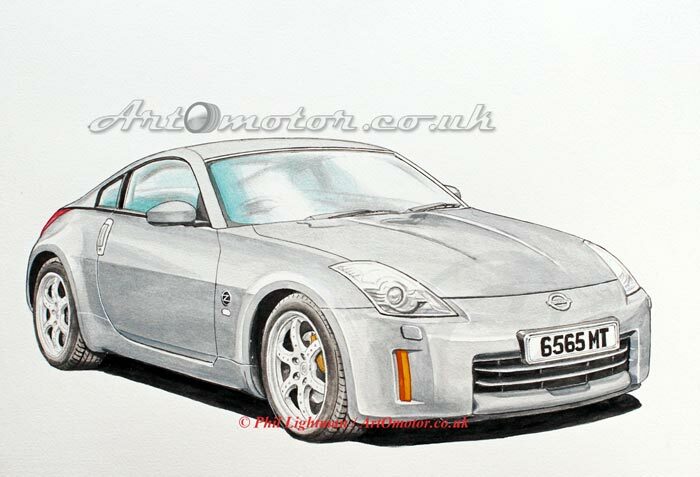 The Nissan 350Z was introduced in 2002, initially only as a Coupe as seen here, with a roadster option available the following year. It is the fifth incarnation of the Nissan Z-car which initially started with the 240Z back in 1969 The car continued in production until 2009 when succeeded by the 370Z - it was known in Japan as the Nissan Fairlady Z. 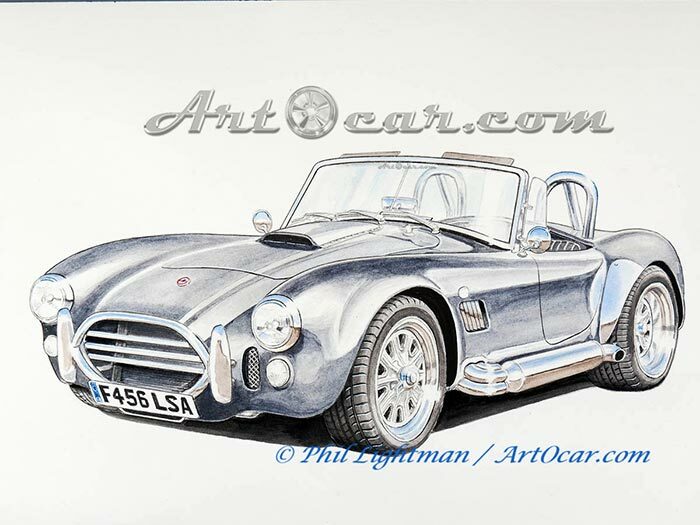 The AC Cobra can trace its origins to the AC Ace of 1951. In 1961, former American racing driver Carroll Shelby approached AC to supply bodies and chassis to the US so he could fit larger engines, initially Ford 4.2 litre V8s. None were sold in the UK until 1964. Later ones were 427s with a re-working of the chassis and bigger wings to cover wider wheels and tyres. Production ceased in 1968, but since then, Cobra replicas have been available as various kits. This one was built by the owner in retirement, leading up to his 70th year. The painting was a surprise Birthday present. Undoubtedly the most iconic bus of all time, and recognised worldwide as a symbol of London. 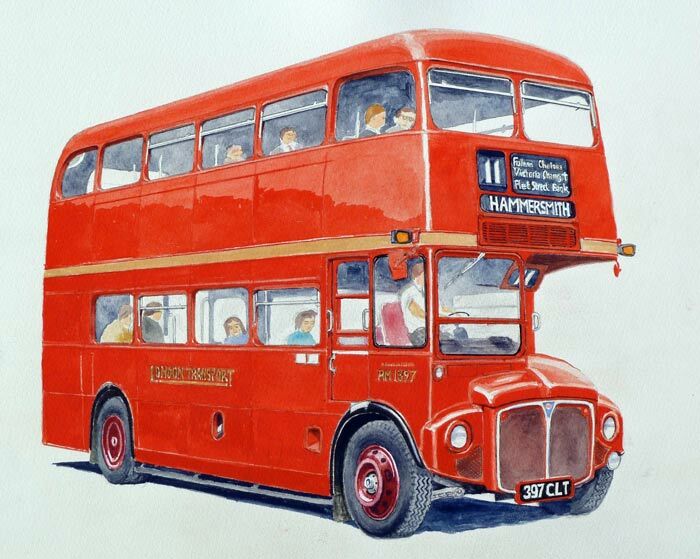 The Routemaster was conceived in the mid-1950s, but deliveries did not really get underway until the end of the decade. Their longevity belies just how suitable they were for London's conditions. Heritage examples still ply London streets even to this day. The vehicle shown is RM 1397 (397 CLT) which entered service from Peckham Garage in 1962. The vehicle is one of many still in existence, and is restored to a high standard. The painting was done for an exhibition, but time-constraints prevented completion of the intended background. It was exhibited as shown, and although failing to sell at that exhibition, sold at another soon after. The image has been one of my more popular greetings card images. The Land Rover Series II was introduced in 1958, with a more rounded body and the barrel shape profile to the upper wings and side skirts. This example is one of a batch bought by the Post Office in 1967, when telephones were still under their control. The vehicle was in use between 1967 and 1982, mainly involved in telegraph pole replacement works. It was restored to original condition in 2008. The commission followed a conversation with its owner at a classic car show. The painting turned out to be the forerunner of quite a few Land Rover paintings and lead to my ongoing involvement with Charity Land Rover events. For the painting, I felt that, with the telephone connection (sorry! ), I had to include a phone box and telegraph pole! The Jensen Interceptor and FF succeeded the CV-8 in 1966, raising Jensen's profile considerably. The design was notable for the large curved rear window, which hinged to give access to the luggage space. The basic shape continued until 1976. The FF version was the earliest production car to have 4-wheel drive and could be distinguished by the longer front wings with 2 vents behind the front wheels. The car shown here is the SP (Six-Pack) which was the most powerful version. The painting was requested by the owner's mother as a surprise present for him. The car was voted best in show at the event in Capel-le-Ferne where I took the reference photos. The VW Camper is properly Type 2 and originally came out in1950 with many different variants available. The most popular version was a windowed version which offered a combination of cargo and passengers (hence Kombi), nicknamed bus or camper. A revised design with bigger windows came out in 1968, known as the bay-window. The Splittie is a real style icon which makes a great subject for paintings. 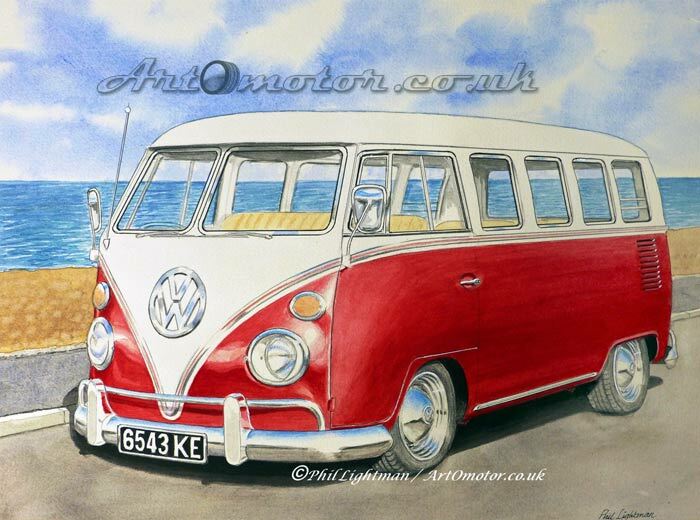 This one is largely based on a locally owned vehicle, although I have chosen to portray it in the classic red & white. Mild customisation includes wider full-chrome wheels and chrome bumpers with 'towel rails'. 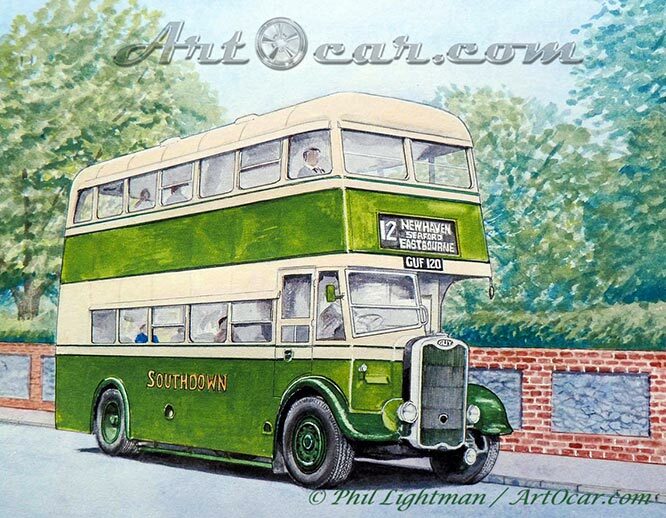 2015 marks the Centenary of Southdown, one of the most popular UK bus fleets, with its distinctive apple green and cream livery. The company operated on the south coast, a popular destination for holidays and day trips. This image originally dates from 2010 but I have now updated it with some additional detailing. This image makes a return to the Gallery in celebration of the Centenary. The image continues to be available as a Greetings Card. Like East Kent and Maidstone & District, Southdown was part of the BET group until they each became part of the National Bus Company in 1969. Southdown's 420 (GUF 120) was a Northern Counties bodied Guy Arab which was delivered in 1944, built to the wartime utility style. It is depicted at Eastbourne. Maidstone Corporation No. 72 (HKR 11) is a 1947 Sunbeam Trolleybus with Northern Coach Builders bodywork. 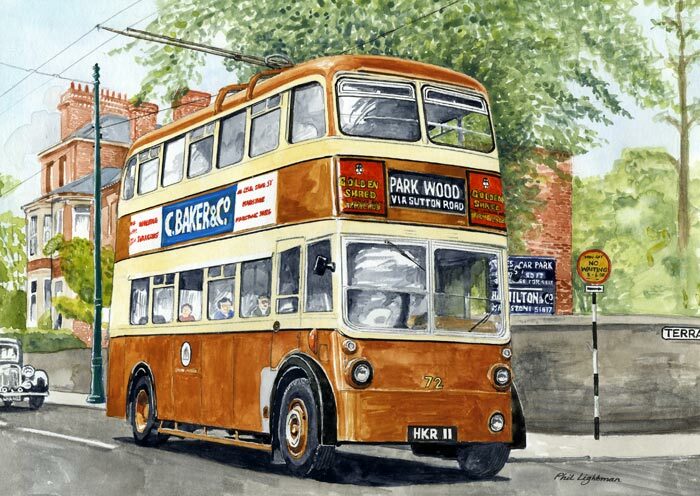 It is shown in the distinctive ochre and cream trolleybus livery. Trolleybuses replaced trams in Maidstone from 1928 onwards, and the system continued to be expanded with development of new housing until 1963, when a decision was made to convert to buses. The last trolleybuses ran on 15 April 1967, with No. 72 being the very last vehicle. No. 72 has been preserved and is normally kept at the Trolleybus Museum at Sandtoft. The vehicle was brought back to its hometown in 2004 to mark the centenary of transport in Maidstone. This is one of 2 paintings I did at the time painted from supplied photographs. The other painting shows the same vehicle in the High Street. Prints of both images were sold to assist with fundraising. 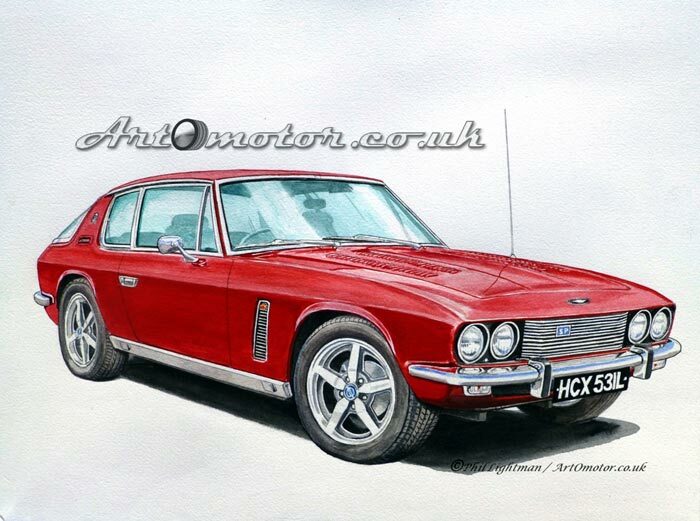 The original was sold into a private collection, but the High Street image remains available. Both images are available as A5-sized greetings cards. This is one of many paintings of Folkestone Harbour I have done and exhibited over the years. 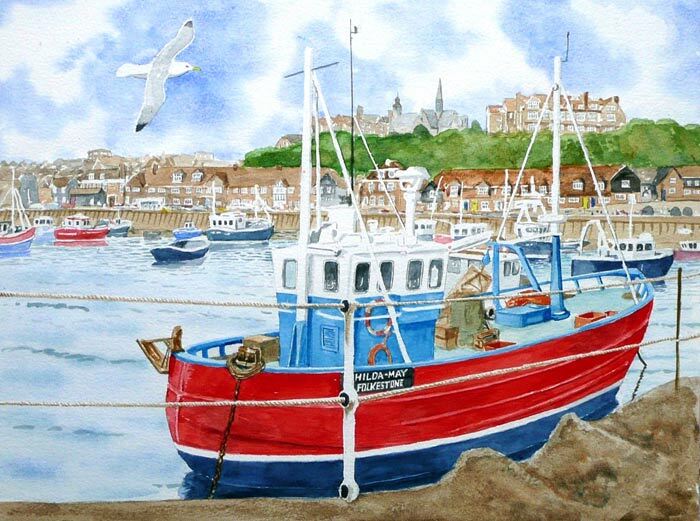 The harbour and the fishing boats always make great subjects for paintings. The scene is based on a photo I took a number of years ago from a pier on which public access is no longer allowed. This was my third and best attempt at the view; we have an earlier version on display at home. The picture won a 1st prize at the exhibition it was entered into, and was sold into the private collection of the Grand Hotel, whose owner runs the excellent Old Timer Rally on The Leas every August. As well as vehicles, one of my other great passions is wildlife, especially birds. I have contributed artwork to the RSPB and Kent Ornithological Society. I have always been a great fan of wildlife art, which I collect mainly in the form of books. 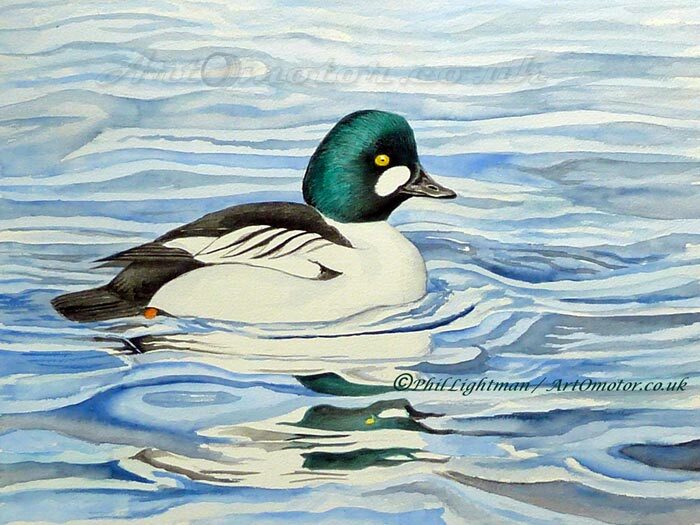 The picture shows a drake Goldeneye, a painting I did for local Art Society exhibition. Like harbour scenes, waterfowl make good subjects as the water creates an additional interesting element in the composition. RF 489 (MXX 466) is one of the sizeable RF-class which were London Transport's standard suburban single-deckers in the 1950s and 1960s. Many of them had very long lives. It is an AEC Regal IV with Metro-Cammell bodywork. This image can be viewed on the Flickr site of the owner and is available as a greetings card. It is one of 4 former London Transport vehicles were all locally preserved in Kent. I was asked by one of the owners to paint each of them as Christmas presents. 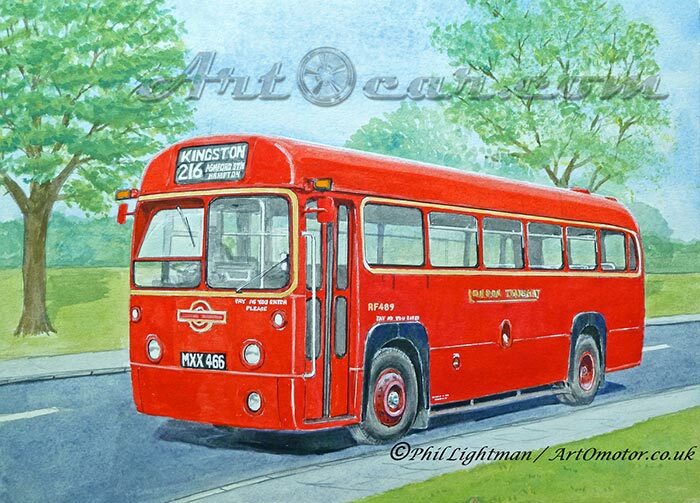 One of the others is the Routemaster (RM 1397) portrayed elsewhere in my gallery.